Serbia, which was the country in focus at this year's Leipzig Book Fair, is still locked up in self-imposed nationalist isolation. Jörg Plath reports back from a visit with mixed feelings. Belgrade's motorists hit the accelerator hard but they're not so heavy on their horns. They speed through the city, but they don't hound the pedestrians. Then again, these two species barely come face to face in the city centre. The city fathers, as if possessed by the spirit of Corbusier, have rigidly separated the bipeds from the quadrupeds. On Brankova Street a line of cars snakes its way into a tunnel that passes under a tower-block to emerge in the maze of streets that comprises the city centre. At every other step there are passages for pedestrians to make their way between the concrete tower-blocks or tunnels under the roads. Everywhere in these ground-level and underground thoroughfares, small trade sprouts its luscious blooms; each pore of this unexpectedly gained public space is exploited. It takes a while for pedestrians to find their bearings after emerging from these artificial merchandise paradises. The streets of Belgrade are tortuous and winding. And not just the streets. "I publish a series with alternative Serbian authors," says author Igor Marojevic, born in 1968. His punky hairstyle and T-shirt imprinted with "Boss" in skewered writing on the front somehow just refuse to fit in with the tastefully decorated rooms of the Serbian PEN centre in Terazije Street this morning. Which authors? "Sreten Ugricic for example," says Marojevic, whose novel "Cut" investigates the Nazi past of Hugo Boss. "Sreten Ugricic, the director of the National Library, is an alternative author?" "Oh yes!" Vigorous nodding. Apparently quite a few things are different here in Serbia. The Belgrade Ministry of Culture has invited German journalists to get acquainted with the country's literature ahead of the Leipzig Book Fair in spring 2011, with its focus on Serbia. Many of the country's authors, however, have been living abroad since the Yugoslav Wars in the early 1990s: writers like David Albahari, Bora Cosic, Vladimir Tasic and Vladimir Pistalo. Since those wars Serbian literature has been translated less often into German than for instance Slovenian or Croat literature (Dragan Velikic or Vladimir Arsenijevic for example). Dragoslav Dedovic, a poet based in Cologne who was director of the Heinrich Boll Foundation in Belgrade and prepared the Leipzig project tells us that there was a time, under Tito, when surrealism was the "unofficial state doctrine". Today, he says, the scene is urban, pluralist and blessed with strong women. So all perfectly normal? Well, confusing rather than normal. Whether you like the national tradition (insert tragedy or history here as preferred) or reject it, or see both as irrelevant for literature – one's position on this provides a "code for the distribution of posts and resources", Dedovic informs me, who himself resigned for this very reason only last December. People in positions of high responsibility in Belgrade were using the Leipzig Book Fair to advance their own "private, obscure and selfish" interests, he says. It's all political – the fighters of 1968 would be amazed to see how relevant their slogan is in today's Serbia, Dedovic adds. The Serbian Ministry of Culture has also invited the "alternative" author Sreten Ugricic. The wiry, alert-seeming 49-year-old doesn't mince his words: the "system" is everywhere, in state publishing companies, television and radio broadcasters and newspapers. Without resistance to the ideological mainstream, moral and intellectual survival is impossible. How can he direct an important national institution then? "The National Library is an error in the system," its director explains. He was appointed by ex-prime minister Zoran Djindjic, who was murdered (more here and here) because of his pro-European stance in 2003. In Sreten Ugricic's new novel "To the Unknown Hero" (Dittrich Verlag, 2011), a Serbian dictator in the year 2014 is prepared to murder anyone and use all kinds of chauvinism to maintain his grip on power. The title is an ironic bow to the less triumphant expression "To the unknown soldier" used elsewhere – and it also invokes the "Monument to the Unknown Hero" which stands before the gates of Belgrade and was built in the 1930s by the Croat sculptor Ivan Mestrovic. The black temple, whose roof is supported by eight caryatids wearing the national costumes of the Kingdom of the Serbs, the Croats and the Slovenes, is Yugoslavia's founding act cast in stone – and Ugricic's novel is a literary attack on the national symbols that have held sway since 1914, when a Serb murdered the heir to the Austro-Hungarian throne Franz Ferdinand and his wife in Sarajevo, triggering the First World War. Ugricic's book is one of the 27 titles to be presented at the Leipzig Book Fair in German. In a number of these works Belgrade and its suburbs Novi Beograd and Zemun play a role. Here, on the banks of the Sava, where the nightlife buzzes on hundreds of houseboats that have been converted into restaurants blaring with turbo folk or gypsy music, including the legendary Black Panthers, the armies of the Ottoman Turks and the Habsburgs once faced each other for hundreds of years: Zemun, with its graceful network of narrow streets described in minute detail in David Albahari's novel "Leeches", was Austrian. 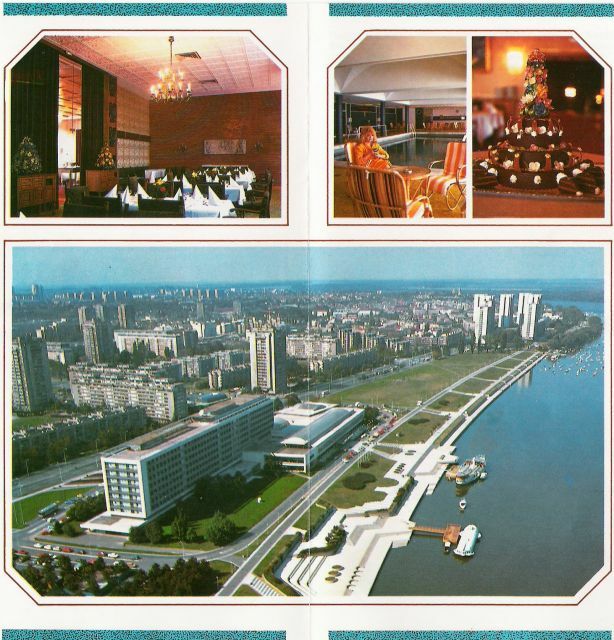 The communists programmatically built up the strip between Zemun and Belgrade with the biggest hotel in the Balkans, the Hotel Jugoslavija which now stands empty, a scattering of concrete tower-blocks and the Communist Party's high-rise headquarters. After it was destroyed by Nato bombs in 1999, the headquarters was turned into the largest shopping centre in Serbia. "That's our transition in a nutshell! Ugricic comments bitterly. Ugricic, Igor Marojevic, Vladimir Arsenijevic, Goran Samardzic, Vladimir Kecmanovic, Vule Zuric and most of Serbia's authors do not live in the countryside, or even in Nis, the second-largest city in the country, which allegedly doesn't boast a single bookstore. They all live in Belgrade or its suburbs, where 80 percent of Serbia's publishers and almost all its bookstores are to be found. The only other alternative is Novi Sad in the polyglot province of Vojvodina, where Laszlo Vegel, Sinisa Tucic and Vladimir Kopicl live and work. Kopicl, unusually, is also the mayor of the provincial capital. Yet despite their geographical proximity these authors apparently have as little contact with each other as they do with their colleagues in neighbouring states. History divides them: under Slobodan Milosevic, critical realist literature became an admirer of those in power, says Sreten Ugricic sitting in the PEN offices, while the state-friendly post-modernists under Tito resisted nationalism. A fierce discussion immediately breaks out among the authors present. The visiting journalists are left with the uncomfortable sensation of witnessing a discussion by proxy that for them remains unfathomable. So they start asking concrete questions: Are the Yugoslav Wars and the role of Serbia, the war crimes tribunal in The Hague and the 700,000 refugees in a country with seven million inhabitants topics that are dealt with in the literature? The interpreter doesn't translate the journalists' cautious reference to the GDR, to their own experiences, and the reaction is harsh. The authors perceive the questions as commands and defend themselves by pointing to the freedom of artists – the very same freedom those asking the questions, now feeling like occupiers sent by the EU, had hoped the authors would exploit. The next day the short-story writer Jelena Jengold tells us of a book about the war: "Forest Spirit" by Goran Samardzic (extracts of which can be found in the recently published issue of Neue Rundschau which focuses on Serbia). But the critics pretended the book never existed, she says. Jelena Jengold is one of those strong women authors Dragoslav Dedovic talked of. The first translations of books by her colleagues Dragana Mladenovic, Radmila Lazic and Verica Trickovic will appear in the spring. Ana Ristovic, who according to Peter Handke is better than Hans Magnus Enzensberger and Durs Grünbein, is also featured in the Neue Rundschau. They write as women, Jengold and her colleagues tell us in unison, but what they write is not to be confused with women's literature, for heaven's sake! Nor are they a group, and no, they don't focus on tradition either. These female authors, like their male counterparts, are quite happy to sit alone in front of their laptops. Dragoslav Dedovic's thesis about strong women's voices begins to look like an inappropriate categorisation. Female and male authors alike also defend themselves vigorously against the book market and marketing. Apparently they are very averse to politics. It pervades everything in Serbia, the economy and culture to an equal extent. Frequently the same people operate in all these areas. This is the "system" Sreten Ugricic talks of. A publisher who rebels against the "system" will be allocated a badly positioned stand at the next Belgrade Book Fair, where most books are sold. Notwithstanding, there are political authors in Serbia. One of them is called Sasa Ilic and looks like Jack Nicholson in "The Shining", only friendlier, and works as an editor at the National Library. Sreten Ugricic thinks highly of the 38-year-old, who together with the younger authors Milos Zivanovic and Tomislav Markovic and the critic Sasa Ciric publishes Beton, a four-page, biweekly supplement of the small daily newspaper Danas. They came up with the idea for the supplement when no one in Serbia was willing to publish a text by Goran Petrovic (whose novel "The Villa on the Edge of Time" has just appeared in German). Since 2006, Serbian authors and authors from neighbouring states write for free in Beton about those subjects that tend to be hushed up in Serbia: war guilt, the victims of the war and nationalism. The tone is irreverent and ironic, burly and also gruff and coarse: "Those who are small must shout out loud," the eloquent Zivanovic points out. Lengthy, theoretical articles peppered with quotes from the household gods Foucault and Deleuze alternate with attacks on key Serbian public figures, some of which could certainly be classified as calumny. The Serbian Right considers the publishers a "gang of four", Bolsheviks, CIA drudges or traitors working for the Croats or the Bosnians anyway. But apart from such aspersions Beton has essentially been surrounded by a wall of silence for four years. This could change now because the four rebels – the Neue Rundschau introduces Ilic and Zivanovic – are currently dealing with the subject of the province of Kosovo and its fight for independence. While representatives of Serbia have been instructed to leave the room as soon as representatives of Kosovo enter on official occasions Beton, in cooperation with Jeton Neziraj, the director of the National Theatre in Pristina, is preparing two new publications. Under the postcard titles "From Albania with Love" and "From Serbia with Love", works by young Kosovo Albanian authors are to be translated into Serbian and the works of Serbian authors translated into Albanian this spring. These will be the first translations from Kosovo in thirteen years, we are told. With a malicious smile Tomislav Markovic, the guy in charge of making the nervous jokes in this round, quotes his country's Right: "Kosovo is the heart of Serbia!" These four defiant authors are sceptical about the future – particularly since the opposition radio programme Pecanik (hourglass) broadcast by the independent radio station B 92 stopped airing in July 2010. Ten years after its founding it switched to the Internet and now gets up to 10,000 hits daily. Svetlana Lukic, the blonde, chain-smoking, forty-something who led Pecanik together with Svetlana Vukovic got tired of her unsuccessful attempts to persuade the 350,000 to 400,000 people who tuned in to give up their racism against the Roma and violence against women. "I'm not a psychotherapist". Pecanik.net is financed by donations from abroad and presents essays about the Yugoslav Wars, the role of Serbian intellectuals, violence against gay demonstrations or the latest poems by Charles Simic in Serbian and English. Many of the authors, historians and sociologists live abroad. "We want to break through the nationalist self-isolation", says Lukic, who worked reporting on the wars until she was dismissed for allegedly being a traitor to Serbian interests. Serbian Pecanik authors often encounter difficulties: historians who write critically about the Serbian Orthodox Church are denied access to the Church's central library. According to Svetlana Lukic, the independent media which existed under Slobodan Milosevic is no more. "The government has metastasised". Confidantes of the president pick up the phone when they consider it necessary. Depressed by the situation, many Serb intellectuals and authors remain silent, some taking on jobs as editors instead, she tells us, adding that in Serbia you can only be a successful writer if you're with the government, not against it. Pecanik also publishes books. Bookstores sell them but don't always pay the bills. Not for political reasons but because they often use the profit to pay their spiralling rents first. Serbian authors, writes Dragoslav Dedovic in the issue of the Neue Rundschau he has co-published, aim at the "realisation of the text", not at changing reality in its different interpretations. In this way they can skirt around the fact that the country is divided – its artists and intellectuals atomised. Serbia has fallen under the spell of the post-Yugoslav Wars because most people in the country want to hush them up. This article was originally published in the Neue Zürcher Zeitung on 14 March, 2011. Neue Rundschau, Heft. 3: Serbien. S.-Fischer-Verlag, Frankfurt am Main 2010. 280 pages. Jörg Plath is a journalist and literary critic based in Berlin.